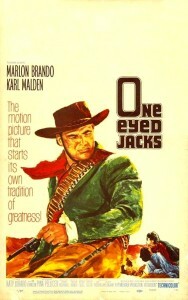 The best thing Marlon Brando did in the 60s was a morbid little Western called One-Eyed Jacks. Paychecks came and went (Candy, The Appaloosa), but Jacks is felt. The film is a transitional Western. It’s weird. Brando slid long before Jacks. The fall from Elia Kazan to Sayonara (1957) will say as much. Arrogant and lazy, he stooped to brood as the “height” of fine acting. His hair got ratty; his weight kicked in. Vanity mocked itself, and Jacks is proof. The movie is the cost of ego. Stanley Kubrick ceded the film to Brando, who tromped the rewrites of Sam Peckinpah and Rod Serling. He shot a million feet of film in six months and Paramount hated it. They didn’t want to market the picture, so they halved it and left it. Soon after, the leading lady (Pina Pellicer) killed herself. Marlon didn’t love her — he just wanted to play around with her. However, the story is strong. Dad (Dr. Evil himself, Karl Malden) and the Kid (Brando) are bandits. Chased by the police, they hide in the Mexican desert. Riding to get a horse, Dad scoots to Monterey and the Kid is ambushed. Five years later the Kid breaks out of prison. Vengeance is his, but only after a few turns of the screw. Shot mostly on site, with deep hues and method acting, the film is hyper-realistic. Boring lulls rotate sudden bursts of violence — but Marlon doesn’t know how to build tension. Cruelty is a gewgaw (e.g., the Kid at the whipping post; the domestic rage of Dad; a drunk [Timothy Carey] forcing his whore to eat). There’s also a Freudian link between the two leads. (Dad? The Kid? Do these names mean something?) This is made worse by the fact that Brando sleeps with Louisa (Pellicer), Dad’s step-child. And, wouldn’t you know, Brando mumbles the occasional howler1, camping the otherwise “serious” nature of the film. 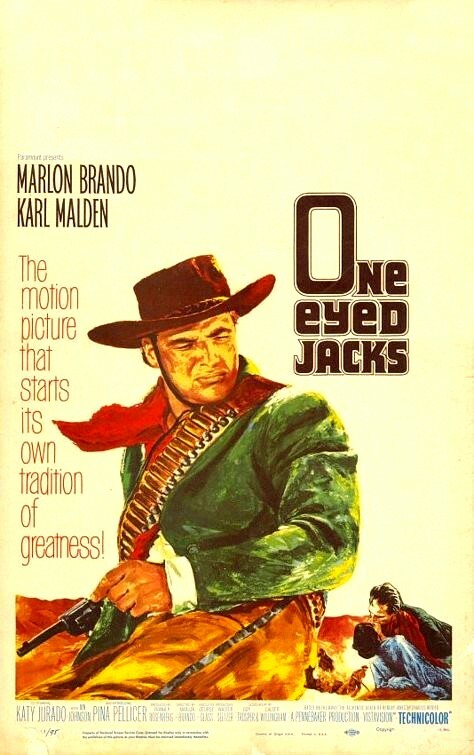 In this way, One-Eyed Jacks is both gritty and lame. 2The film made its mark on Quentin Tarantino, Martin Scorsese, Sergio Leone, and Monte Hellman.